Red pigmented concrete provides the geometric forms of this archaeology museum in Peru, designed by Barclay & Crousse to replace another destroyed during an earthquake. The Museo de Sitio Julio C Tello stands at the entrance to the Paracas National Reserve, on exactly the same site as its predecessor, which was ruined during an earthquake in 2007. This location is in close proximity to the Great Paracas Necropolis – the oldest archaeological site in the region where, in the 1920s, explorer Julio C Tello discovered burial sites over 2,000 years old. These sites provided the exhibits for the museum. The new design by Lima-based Sandra Barclay and Jean Pierre Crousse brings back some of the qualities of the old building – the low-rise form and the strong geometric volumes – but uses a completely different materials palette. While the previous museum featured a prominent stone facade, Barclay and Crousse opted to use concrete for the new structure. 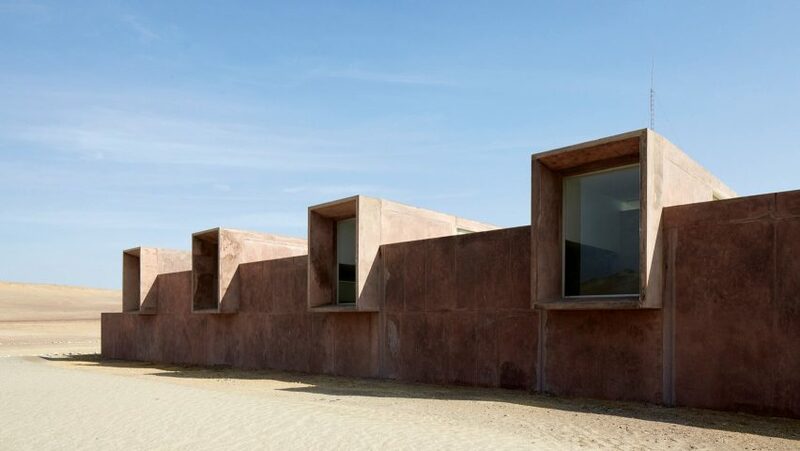 But they also chose a red-hued pozzolan cement, allowing the building to complement the tones of the arid desert landscape. "The exposed concrete and polished cement that constitute its materiality, blends with the neighbouring red dunes," they said. "The patina left by builders in the polished cement give to the museum a ceramic look that resembles the pre-Columbian ceramics that are exposed inside." The museum is divided up into two wings – one containing the exhibition galleries and conservation areas, and another housing education spaces. A single corridor, described by the architects as a crack, separates them. On the southern side of the building, a row of four boxy windows project through the facade. These allow light to enter, but offer protection from direct sunlight. Other details include a vibrant blue wall, which marks the building's entrance. Sandra Barclay and Jean Pierre Crousse founded their studio in 1994 in Paris, but moved back to their native Peru in 2006. Other recent projects by the pair include a university campus in the north Peruvian desert. Photography is copyright Cristóbal Palma and used with permission.